A Few Scraps: Portland for the win! In some sort of cosmic Portland karma vortex, the winner of my giveaway (of Portlander Violet Craft's fabric) is Elsa. This is awesome because Elsa lives here in Portland too and is a fellow PMQG member. 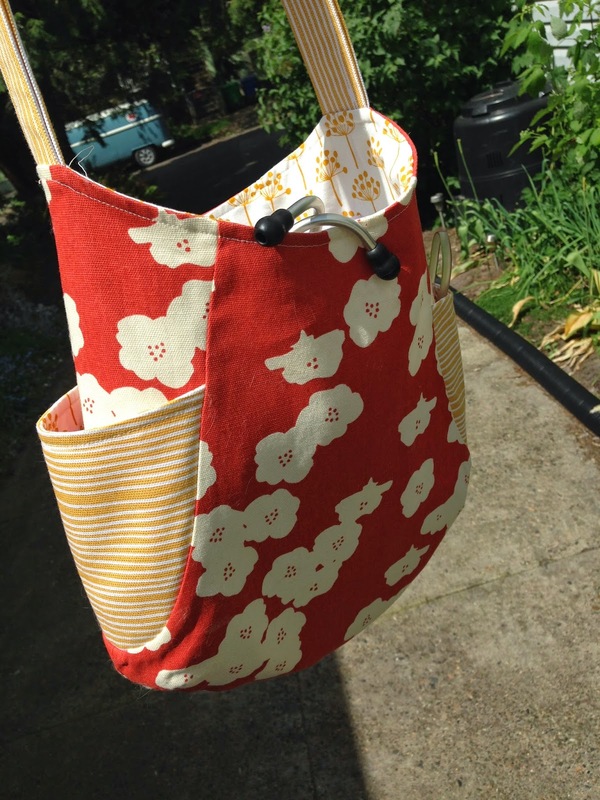 She made this beautiful and summery 241 tote and did an Instagram giveaway that I won. Now a few weeks later I get to give her supplies for a new bag! Isn't that cool? Portland has been really gorgeous lately. A lot more appointment cancelations in our clinic as people stay out and enjoy the weather. The rain returns tomorrow, which happens to be when I give my once-in-a-great-while FMQ class at Modern Domestic. So if you're in the area and are ready to do indoor activities again you should come join me. Thanks to everyone who said congratulations and nice things about the bag and the book. My email got really confusing with those hundreds of comments so there was no responding, but I read them and appreciated you saying so. See you soon! My first ever giveaway, the lady lived a few miles from me. Instead of mailing it to her, we met up and had lunch instead. It was much more fun that way. Well that's funny because the winner of my give away lives in Portland too! How does that happen? Thanks again Christina ~ love how it turned out!!! that really is a fabulous bag ! I must remember about that pocket on the side of the bag ., also the FMQ pattern . loveit .